What Was It Like For Everest’s Pioneers? Stories of the first Everest expeditions – the danger, the adventure, the determination – continue to inspire those who embark on an Everest Base Camp trek today, and it’s easy to wonder, but hard to know: what was it like for those early pioneers, as they ventured into what was then a barely explored world of harsh, extreme beauty? Today, the beauty and sense of adventure remain, while the risk is greatly reduced both by modern mountaineering techniques as well as the legacy of those early trailblazers. And although there seems to be an impassable chasm of time between us and them, clues about their experiences can be found by following in their footsteps. It is always worth acknowledging the legacy of those who came before us, and those who join Mountain Kingdoms for a Himalayan adventure of their own have plenty of opportunity to do so – we even have a trek dedicated to this very concept, the Pioneer’s Trail from Jiri to Base Camp. Starting with a longer exploration of the foothills and Sherpa communities than you would usually get on an Everest Base Camp trek, it’s possible to really get a sense of the world that Tenzing Norgay, one half of the pair to first summit Mount Everest, came from. 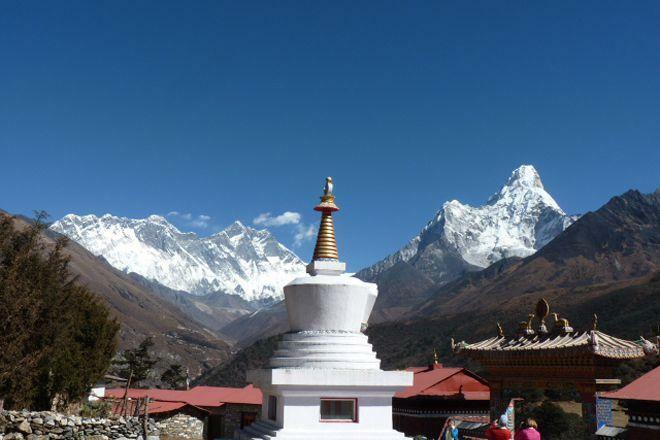 At Namche Bazaar, trekkers can see a Buddhist stupa built in his honour to commemorate the 50th anniversary of the first ascent. Later in the trek, we stop at Thyangboche Monastery, where he spent time as a monk. Although the other half of the history-making pair, Sir Edmund Hillary, has his origins all the way over in New Zealand, it’s certainly possible to connect with his legacy on an Everest Base Camp trek, thanks to the Trust he created to provide healthcare, education and other vital projects for the Sherpa people. In his lifetime he returned to the region that brought him worldwide fame many times, and today’s trekkers can visit schools and clinics built by the Trust. So, while we’ve come a long way from those perilous early days, reminders of the world that the first climbers lived in and loved are all around.